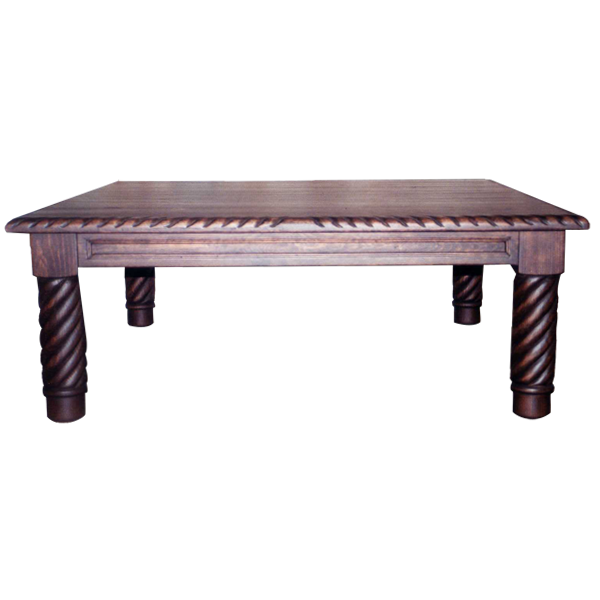 This handcrafted, Western style coffee table features marvelous, hand carved designs created by our skilled craftsmen. The rim of the wide, rectangular top of the coffee table is adorned with lovely, hand carved, scallop designs. The top rest on a solid wood base, and each side of the base is embellished with narrow, beveled, rectangular cut designs. The coffee table is supported by gorgeous, hand turned, spiral legs, and the legs end in tapered, hand turned feet. It has an elegant, mahogany finish, and it made with the best, sustainable, solid wood available. The coffee table is 100% customizable.